WASHINGTON — The U.S. Air Force announced on Wednesday it is awarding three contracts collectively worth about $2 billion to Blue Origin, Northrop Grumman Innovation Systems and United Launch Alliance to develop launch system prototypes. The funding is for the development of competing launch system prototypes geared toward launching national security payloads. Each company will receive an initial award of $181 million, $109 million of which are identified in the announcement as fiscal year 2018 funds. The Launch Service Agreements are for the development of Blue Origin’s New Glenn, Northrop Grumman’s OmegA and ULA’s Vulcan Centaur rockets. The awards are part of cost-sharing arrangements — known as Other Transaction Authority agreements — that the Air Force is signing with the three companies to ensure it has multiple competitors for future launch contracts. 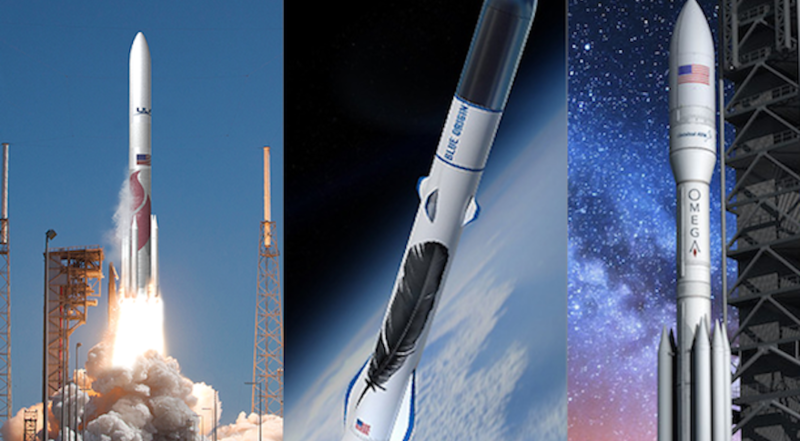 The Air Force has committed through 2024 a total of $500 million in OTA funds for Blue Origin, $792 million for Northrop Grumman and $967 million for ULA. SpaceX previously received an LSA award but did not make the cut this time. However, SpaceX remains eligible to bid on future Air Force launch contracts, Pentagon officials said. The Launch Service Agreements will “facilitate the development of three domestic launch system prototypes and enable the future competitive selection of two national security space launch service providers for future procurements,” the Air Force said in a news release. The new launch strategy is in response to the congressional mandate to transition away from reliance on Russian rocket propulsion systems and the planned retirement of ULA’s Delta 4 rocket. By 2022, ULA will no longer be able to use Atlas 5 rockets powered by the Russian RD-180 engine to fly military satellites. The three selected companies will be competing again for continued funding during the second phase of the OTA program. The Air Force plans to issue a solicitation for phase 2 in 2019 and make its selections in 2020. Only two will be selected to continue to receive OTA funds. Of the three winners of this phase, the one that does not win phase 2 will not be able to get the full amount of OTA funding that the Air Force announced it would commit. Roper noted that SpaceX has won seven Air Force launch contracts, five for Falcon 9, and two for Falcon Heavy. “The goal of this OTA is to make sure we have a competitive industrial base,” Roper said. His comments suggest that SpaceX may have been left out because its rockets are mature and the Air Force preferred to spend OTA dollars on new vehicles to add to the mix.